A dental crown is a prosthetic tooth-shaped “cap” that is placed over a damaged tooth or implant. It restores the tooth’s shape, size, strength, and function. When dental crowns are cemented into place, they fully encase the visible part of the tooth that is above the gum line. Our dental crown procedure just might be what you need! Dental crowns are the treatment of choice when teeth are badly broken, extensively decayed, or in need of crown replacement. On implants, they are also the treatment of choice when an individual tooth is missing. Because the enamel of the original tooth has to be completely removed for a dental crown procedure, Dr. Alexander prefers to do a more conservative onlay or porcelain veneer restoration when possible. An onlay is a porcelain restoration that fits in and over a portion of a natural tooth. A porcelain veneer is a wafer-thin laminate to improve a tooth’s color, size, and shape. Dental crowns can be made of all porcelain, porcelain fused to gold, porcelain fused to zirconium, or all gold. 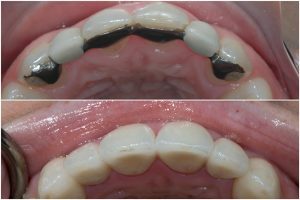 The best crown material is often determined by an individual’s bite and esthetic considerations. A porcelain crown is totally natural looking. Today, gold crowns are typically used only on the back teeth that do not show when smiling. 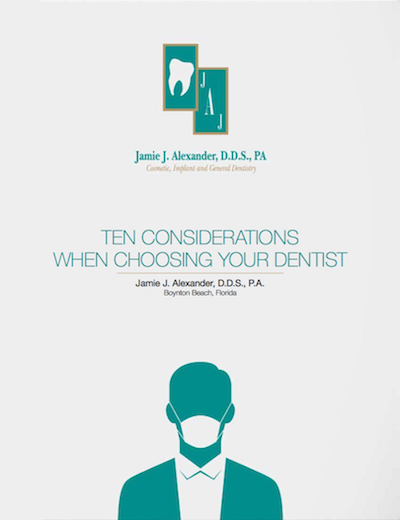 Dr. Alexander will discuss which materials he recommends for you and the considerations that go into these choices. Many times during a dental crown procedure, Dr. Alexander creates a provisional (temporary) crown from tooth-colored resin for you to wear for a period of time. This is done both to ensure the shape of the tooth functions comfortably in your mouth and to make sure it’s aesthetically pleasing for you. When you and he are both confident the tooth design works well and looks great when you smile, he will instruct a dental lab to make your customized porcelain crown. Get a dental crown that looks great on the face, great on the smile, and is great for your oral health. Contact Dr. Alexander’s office today!